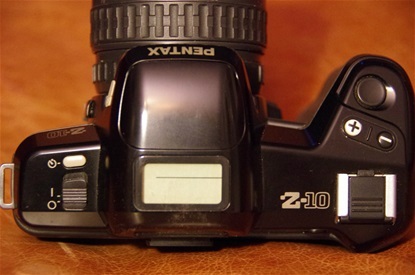 The first member of the Z family was the Z-10, released in 1991. The house was showing some of what was to come with the Z-1, while the functions were more on SF level. 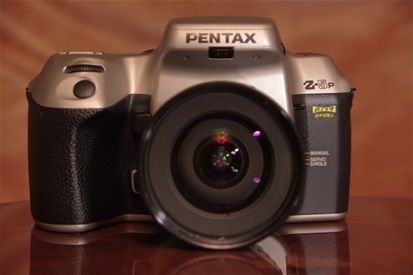 This was Pentax' first camera with a pentamirror instead of the brighter pentaprism. From now on the more expensive models featured the full prism, while the economical models used the less expensive, less heavy but darker pentamirror. Size: 146x92,5x66,5. Weight: 490 grams. Sn: 5717672. On-off, self timer, pop-up flash, display, over/under exposure button (on back wall, over film door), up-down button for shutter time. Program modes: Hyper Manual, M, P, B. The Z-1 was a leap forward as compared to the SF. AF was considerably faster, as was the handling of the camera. Size: 152X95,5X74. Weight: 650 grams, officially. Mine weighs in at 641 grams, with all plastic covers except the lens mount cover. S/n: 5886951. 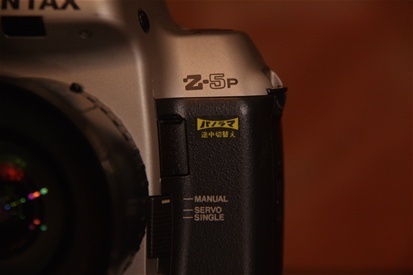 Z-1 introduced the Hyper Program, making it possible to oversteer any program with selected shutter speed or aperture by turning either front dial (shutter) or rear dial (aperture). 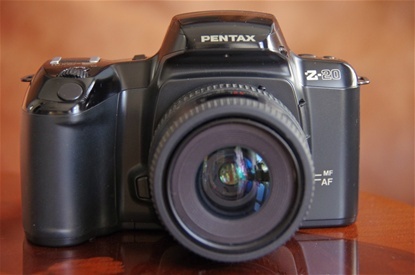 This feature has followed Pentax since on their main cameras and makes them a dream to handle. There is even a green program, a special A program if you don't want to think. Or have lost the ability. Or never got it. 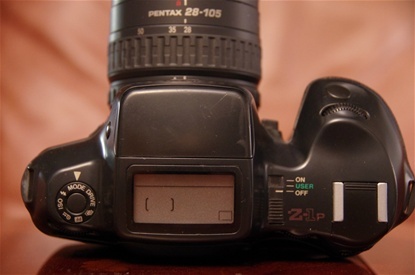 There is also a PF, a personal/Pentax function mode that lets you choose your own basic setup within a 18 point menu. Improving ergonomics plus faster handling by a good mix of dials, knobs and buttons. 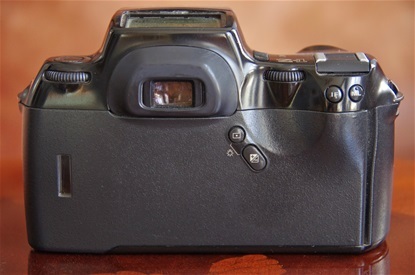 One button for over/under exposure by up to three steps, one for average/spot metering (NOT three modes, as claimed in Pentax Forum review), one button for back to basic and one for memory lock. Besides the two dials at the top. Program series: Hyper P, Hyper M, A, Av, Tv, B. Also programs for Normal, Sport, Portrait, Landscape, Close Up, Extra Flash and Contrast Control. 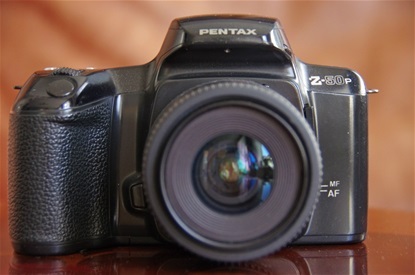 The Pentax Z-5 was introduced in 1993, possibly for sale from 1994, as Asahi Pentax Historical Club presents it as a '93, while Pentax Forum says '94. This camera was produced only for the Japanese marked. Like its half twin, the Z-1p, It is very rare, and hardly ever offered for sale. It is built with most of the same characteristics as the Z-1, and with all the major programs, depending on the lens you put on. In fact, as long as there is the HyperProgram, with superb manual oversteering, and a full manual plus B, you have what you need. 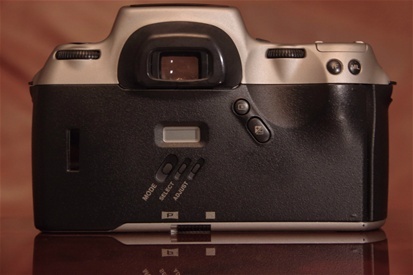 However, it lacks the Personal Function mode introduced with the Z-1. Size is identical to the Z-1, but weight is, for some reason, 8 grams more. 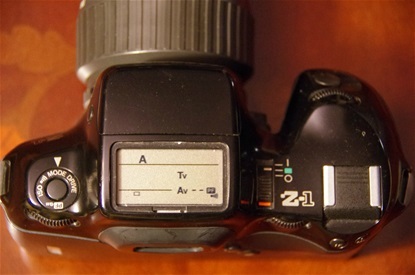 The functions follow the Z-1, except for the PF mode on the left dial. That was kept for the top series alone. 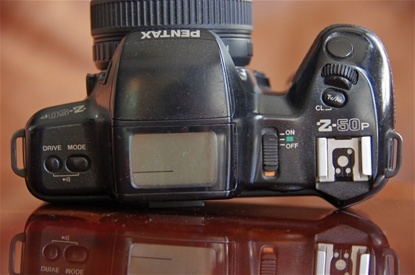 The viewer contains the same information as the Z-1: shutter time, aperture value, an underlining of the values if you have oversteered, green light for in focus, red symbol for need of flash, a symbol for memory lock and a plus/minus for over/under exposure. On the back wall there is a button for spot or average metering, for over/under exposure, for back to basic (IF) and for remembering exposure setting (ML). 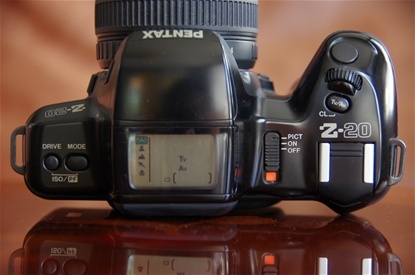 Plus the two dials for aperture and mode settings. Lacking the many programs of the Z-20, but still featuring Hyperprogram, P,Tv, Av, M, Hyper M and bulb. Size: 146x93x66mm. Weight: 500gr. Sn:6590860. Layout almost identical to the P-20. 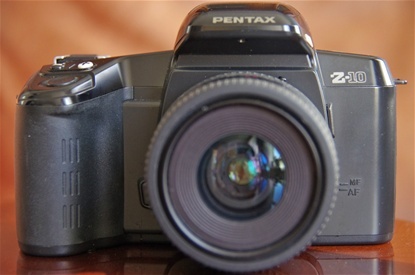 The Z-1p of 1994 was to be the flagship of Pentax SLR cameras for many years. The exterior is almost identical to the Z-1. of 1991, but there are some differences inside. 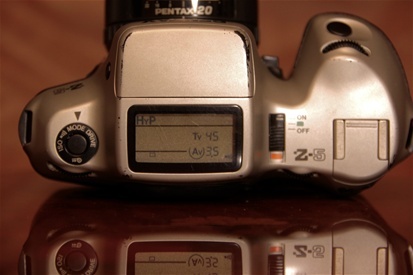 First, it features a 4 frames per second motor where the Z-1 has 3 f/s, then a Panorama mode, popular at the time. But it also added, for the first time, a center weight meter mode to the 8 segment and the spot metering, thus offering three modes. And the viewer gives more information than previous ones. 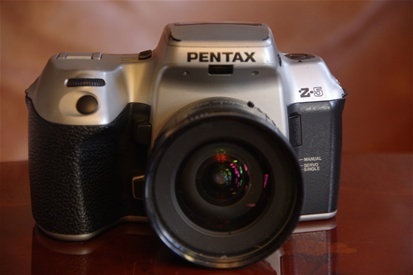 Really a top camera to use, and one of the most popular Pentaxes ever, judged by experienced Pentaxians. Size is identical to the Z-1. Weight: 644g Sn. 6996170. The lens here is a Pentax FA 28-105 3,2/4,5 IF AL. Sn. 5735513. 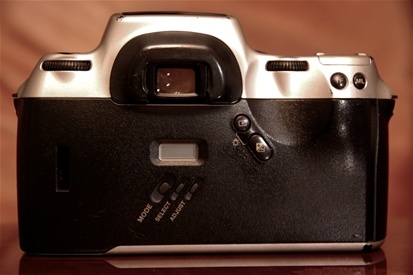 The shape of the camera is exactly like the Z-1, but screen and function controls are a bit different. 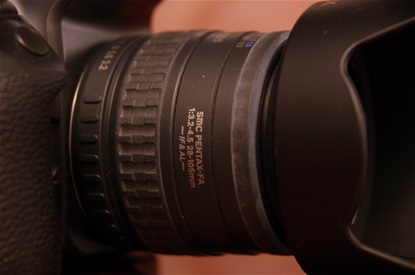 The function ring gives 3 more options, PF, flash and exposure compensation. (Exp. comp. is found on Z-1, too, but hidden behind the Drive mode.) 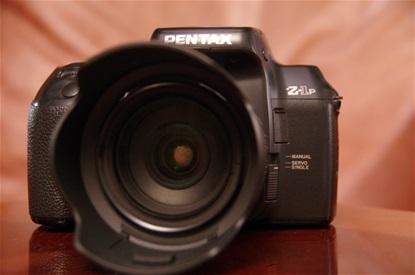 The Pentax Function (PF) menu is now reduced to 15 points from the Z-1s 18 points. 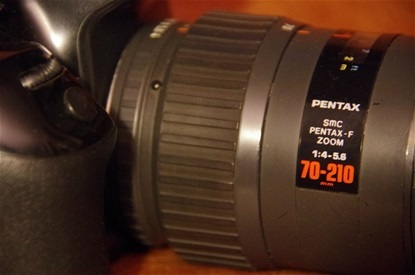 The Pentax Z-5p of 1995 followed up the Z-5, but was upgraded with the new features from the Z-1p. That is: a third metering option (center weighed), and a more informative viewer. Plus the panorama option. Size like Z-1/Z-1p, Z-5. Weight: 643 gr. Exactly like the Z-5, but with the Panorama slide knob added. Obviously the Z-5p was meant for Japan only. Compared to the Z-50, it had no Hyperprograms (possibility to oversteer programs without changing modes). On the other hand, it featured the many programs, like Sport, Portrait and so on, from the Z-20. Size: 146x93x66,5 mm. Weight: 450 grams. Sn: 6933528. The last international model of the Z family. Different from Z-20 and Z-50 by the dial for Off, On and Pict. 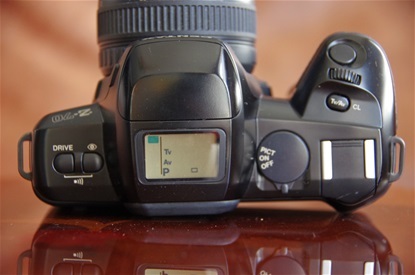 Mode button moved to upper back wall, beside the over/under exposure button. Please see my last answer. 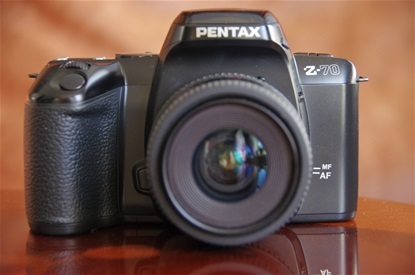 It is right under your recent email on the Pentax Z side. Interesting. 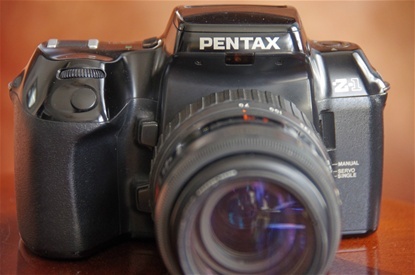 Please contact me on bosse@pentax-slr.com for pictures to confirm model, serieal number and condition. What do you concider right price? Thank you! Z-1p is available from time to time, but not at the right price, so far. The Z-5 and Z-5p are among the rarest, sold only in Japan.Still hunting!